In September, Johnny and I will be moving into our first flat together. Moving in with a fella; does this mean I'm a proper grown up now? We've just got a studio flat for the time being. It's definitely going to be cosy and we're already looking at potential bigger places but for the time being it'll do us just fine. We're actually still going to be living within my current student accommodation for a number of reasons, so of course there are those frustrating regulations regarding what we can and can't do to make it our own. But don't you worry, I've popped my interior design hat on and I'm ready to make it work. You know the drill with student accommodation decor; very beige and boring. But on the bright side I've got a blank canvas to work with, which is exciting. Like always, I've been browsing eBay like there's no tomorrow, tracking down bits and pieces that will help to make a flat our home without costing us a pretty penny. But whilst buying secondhand is something I love doing, it's always nice to kit your home out with some new pieces too. 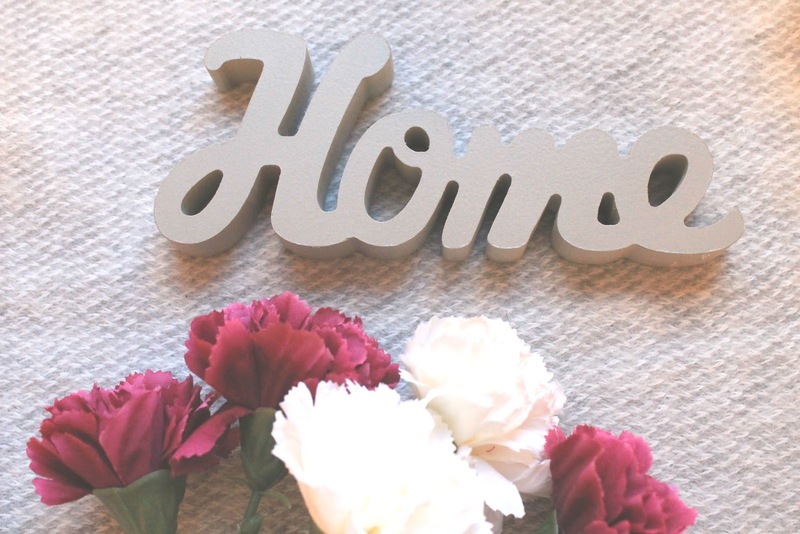 I have several go-to sites and stores for homey bits and bobs, and I thought I'd share some of the best pieces which have caught my eye and left me craving them. I'm a sucker for a good cushion, especially when it is adorned with a cute little quote. Whilst I don't necessarily need another cushion, this one's too lovely to resist. Johnny has banned the vast majority of my cushions from our bed because they "take up too much room" but I'm hoping I'll be able to sneak a couple on there to jazz things up a little. If not, they'll make a lovely addition to our sofa. This cushion is only available online here and retails at £20.00, but is currently on sale for £8.00. When browsing the haven that is the Sass & Belle website I came across these gems and I fell in love. I'm imagining cosy Sunday mornings in bed with his and hers mugs and a good bit of telly; sound's lush. And they stack, is there anything more satisfying? This set of two mugs is available online here and retails at £7.50. How gorgeous are these rich tea biscuit coasters? Definitely a sentence I never thought I'd say but hey ho. They're made from sustainable mango wood and resemble what are arguably the best biccies going. The perfect addition to any coffee table. Put your hands up if you didn't know Sports Direct sold homeware? I definitely didn't, but it was a pleasant surprise as there are some real gems on their website. I've fallen weirdly in love with this metallic latern from The Spirit Of Christmas. The gold glitter finish is a tad on the tacky side but I actually love it even more because of that. The lantern features a flame-less candle which tackles the no-candles rule in our new flat; fantastic. This lantern is available online here and retails at £3.00. What a cheeky little plaque, I'm in love. I think this would be a great decorative touch to our en-suite. The ornate and retro look is exactly to my tastes also, so what more could I ask for? This wall plaque is available online here and retails at £7.50. There's nothing better than the feeling of sliding your feet out of bed in the morning and them landing on a super soft rug. I'm a sucker for anything in the colour 'duck egg' - the colour scheme for several rooms in my family home, including my bedroom - so I couldn't resist adding this rug to my new flat wishlist. Johnny and I are both super Harry Potter nerds so it would only be right that our first home together was kitted out with at least a little bit of magical merchandise. I've been so tempted to buy this sign since I first saw it in Primark stores. I want to pop it above the toilet in our en-suite for the pure reason of the fact it'll make me giggle every time I go in there. 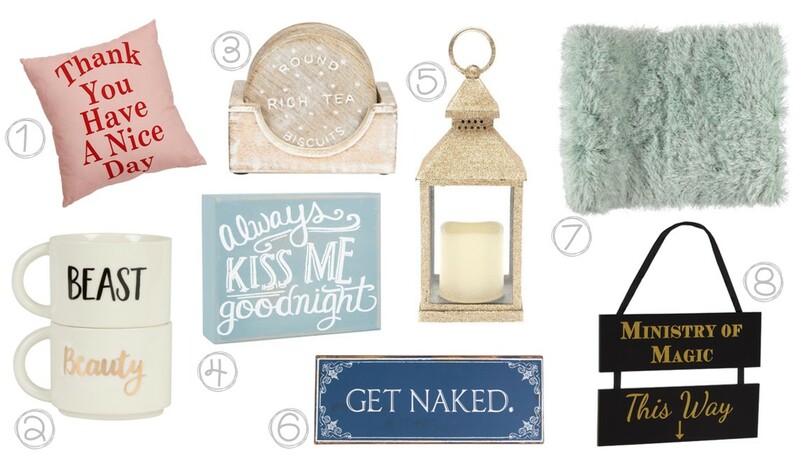 Are there any home decor items you're craving at the moment? My boyfriend and I are moving this weekend. While I felt unprepared yesterday with how much I needed to do, seeing the flat starting to take it's place has now made me realise that I was needlessly worrying yesterday and I'm more prepared than I thought I was. We still have some more bits to move tomorrow but have made a good start so far today, considering I've been working and James (the boyf) has spent the afternoon making sure we'll have Wi-Fi ready and keys that work. 1. The day you get your keys, go around the flat and take photos of what the place looks like before you move your possessions in so you can refer back to the photos when you move. Also take photos of anything you notice that is damaged. We noticed at least one thing in every room, all minor things, but still worth noting so we don't get the blame for it should it deteriorate during our tenancy. 2. Make sure EVERYTHING works as you expect it to, i.e., make sure doors open/close and lock properly, keys work, the intercom, windows open, close and lock, etc. Also, when checking locks and doors, make sure you've got someone on the other side of the door or your phone to hand just in case something goes wrong - I learnt this the hard way! (I plan to share a post on that soon). Good luck with your move! You'll love the independence and being able to put your own mark on a place with Johnny!